A research and design-led approach to rebuilding trust in public institutions through direct dialogue. Over the past fifty years there has been a shift in how citizens perceive their efficacy over, and relationship with, public institutions. Heightening negative sentiment has created growing distrust; which in recent years has manifested itself in the rise of anti-government populism. There are many contributing factors as to why this phenomenon has developed. Political systems are structured to be dictated by four and five-year election cycles, but the modern world moves much faster. This results in a lack of responsiveness which means citizens have less agency over and are more disconnected from, their public institutions. Citizen-government communication, up to now, has relied on mass media to interpret and distribute news to citizens. The democratisation of media has greatly weakened this communication channel. Social media’s growing prevalence as a means of disseminating socio-political information has further disrupted traditional channels of communication between government and citizens. While technology has created certain expectations and challenges, it also presents opportunities to engage citizens in ways never before imagined. There is potential to foster direct dialogue between governments and citizens, augmenting and even circumventing the need for mass media. The objective of our research in this area is to reconnect citizens with government; to drive participation in political conversations, and to ensure public representatives can effectively respond to citizen-driven correspondence. Seventy-five countries have signed the Open Government Declaration stating that they will increase the availability of information about government activities, improve access to new technologies for openness and accountability, implement anti-corruption policies, and support civic participation. Much of the early focus of this Open Government Partnership has been on government-initiated dialogue. As design professionals, we at Frontend.com always strives to understand the needs of the users before creating solutions. Citizens want to be able to express themselves to their representatives at all times, not just when they are spoken to. We believe citizen-initiated dialogue can be a powerful tool to improve citizens’ sense of agency. To ensure that it can be implemented effectively we have developed six design principles for consideration. Easily accessible and engaging for the citizen. 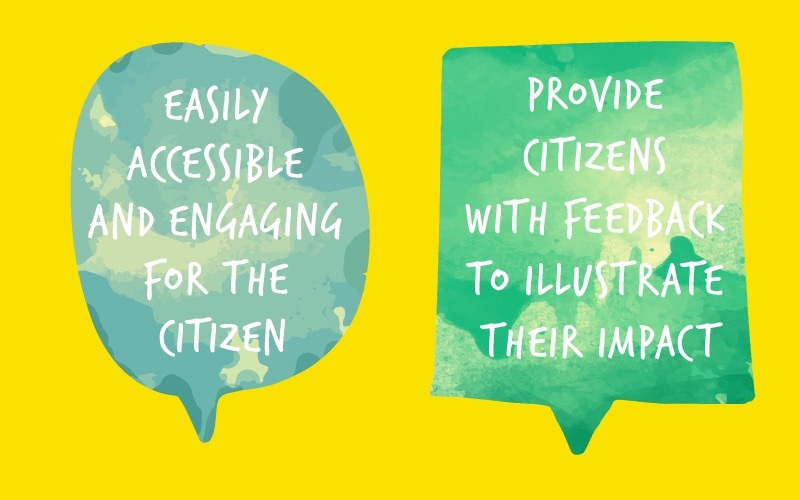 Provide citizens with feedback to illustrate their impact. Help contextualise or challenge polarised viewpoints. Each step of the process must be clear and open to the citizen. Create methods for engaging citizens which are not only easy to access and to use, but are also desirable. Solutions should consider under-represented voices and aim to be appropriate for all. Provide public representatives with an efficient and effective method of listening to, and communicating with, citizens. So they can understand their concerns, and work to resolve them. Once citizens engage, ensure the interaction is meaningful by providing citizens with an insight into the process and keeping them updated on the progress of their issue. Providing transparent updates should help to increase both civic literacy and the sense of agency. Government-initiated public consultations are facilitated within the legislative journey and can lead to more impactful civic engagement. However, their limited timeframe provides a narrow window for citizens to feel invited to be part of the solution. Providing a direct communication channel would allow citizens to connect with their public representatives. Their participation moves them from being active opponents to constructive advisors. Any system for citizen engagement will have inherent biases built in. A digital text-based solution can exclude the elderly and people with learning disabilities. Standalone web-portals will likely be used only by those who are already politically engaged. From our research, we established that the most inclusive solution would be a channel-agnostic system, where citizens could communicate via applications that they already use. Integrating with widely used services is likely to result in a more representative pool of users. To wean people off expressing themselves on closed social networks, system designers need to allow citizens to share their ideas easily onto this new platform. Almost half of Americans are classified as ‘Interested Bystanders’. That is they pay attention to issues, but do not actively voice their opinions or take action. With reduced barriers and given the right circumstances, these people may be prompted to civic engagement. The challenge is to identify these obstacles and create solutions which include even the most disenfranchised citizens. Developers of such a system must not focus solely on the technological platform, but rather on creating a new environment. The goal must be to move perceptions away from hoarding ideas and towards sharing them. Keeping an idea to oneself means that no one else can act on that idea. The system must be framed so that sharing an idea is seen as an act of participation in civic life, that one’s ideas are part of the public good, and that this sharing is vital to good citizenship. The greatest barriers to civic participation are income and education. Many citizens with lower levels of education struggle to articulate ideas or issues clearly, particularly in writing. Any system that seeks to gather public input should be mindful of the basic communication challenges which many people experience. Their fears and difficulties must be appreciated and provisions made to help frame and articulate the contributions people wish to make. One method is to help citizens to structure their messages. A conversational interface, such as a chatbot, could prompt them and break their message into comprehensible steps that will be potentially actionable. Progressive tools such as chatbots must be selected strategically and should emphasize transparency. Online public polls do not generate genuine conversations. Polls create a public-versus-government sentiment as they often attract hard-line views which stifle dialogue. Lobby groups also encourage their members to flood such polls and skew perceptions of public opinion. Online campaigns are effective at rallying large numbers when they paint a black-and-white picture. These combative methods of public engagement create defensive distance between citizens and their public representatives. Direct human-to-human conversations can lead representatives to a greater understanding of the true needs of their citizens, and equally, give those citizens an understanding of the challenges facing policymakers. 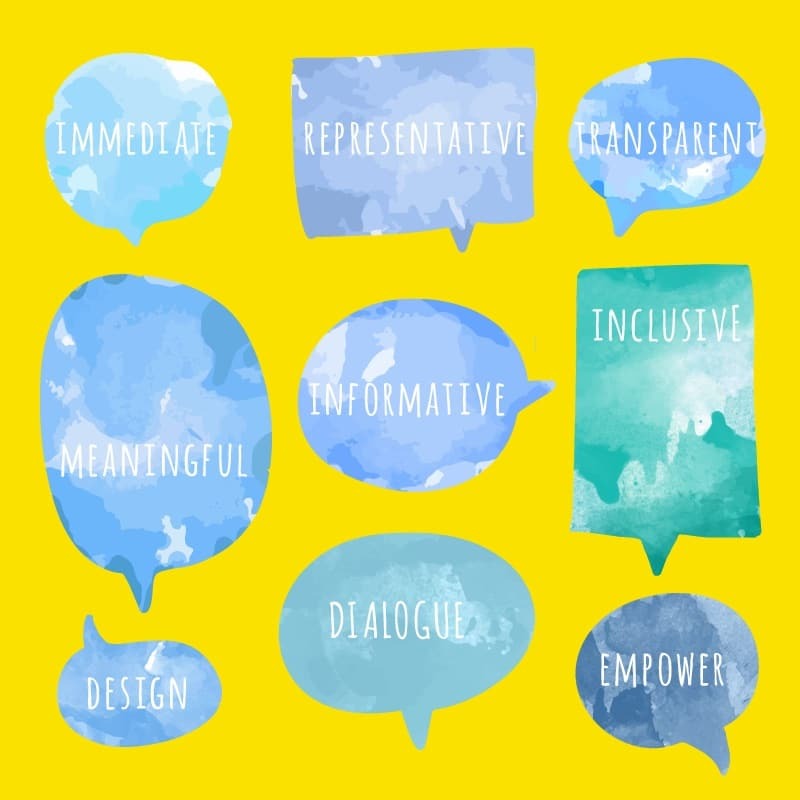 Although direct dialogue may not be appropriate in every scenario, fluid communication has the potential to empower and better inform both citizens and representatives. Citizens who are passionate enough to reach out usually have clear-cut opinions or are directly affected by the relevant policy. Ideally, policymakers need to make decisions based upon the broader stakeholders and not just on those inclined to engage. However, the full range of public sentiment can be challenging to uncover. The difficulties citizens have in sharing opinions with public institutions means that global corporations such as Facebook and Twitter have greater insights into public sentiment on many policies than governments do. Citizens use those familiar portals to vent, debate, and propose ideas. This gives those platforms knowledge far beyond the reach of government. Technological advances, while beneficial in a macro sense, must be grouped with human interventions when evaluating policy decisions. Truth is found in the context. Citizen input is pointless unless it is heard. So achieving buy-in from public officials and representatives is the key factor for success. The amount of correspondence public representatives are expected to manage has dramatically increased in recent years. The reality today is that citizen-engagement and consultation processes are already inefficient and straining. Unheard citizen input only deepens divisions between citizens and government and further erodes public trust. Any new system which accepts citizen input should make all such correspondence as easy as possible to review and act upon. This is the greatest challenge facing all such systems. Citizens can now be handed responsibility as decision-makers, not just as idea-raisers. The legislative journey is divided into four phases: Idea Generation; Understanding; Deliberation; Action. The Action phase will always be the remit of the State. There is potential to open the Deliberation phase to citizens. Being directly part of the process from generation to deliberation can be hugely empowering for citizens. Positive behaviour should be reinforced to keep citizens engaged. We conducted a pilot study with Cork County Council in Ireland. We noted that engaged citizens who received updates on the progress of their requests had a thirty per cent more favourable opinion of their local government. Also, they were almost twenty per cent more likely to feel their personal potential impact on wider society. When providing feedback and demonstrating the impact of their contribution, we found citizens to hold a more positive assessment of their personal efficacy, even if their initiative was ultimately unsuccessful. A larger study, looking at the Fix My Street portal, showed that a successful first experience of reporting an issue through this platform resulted in a 57 per cent increase in the probability of a citizen submitting a second report. The same study noted the importance of responsiveness for fostering an active citizenry and suggested that “genuine responsiveness to citizens’ input encourages greater participation”. A direct dialogue channel is a significant opportunity to make citizens aware of the large impact of small wins. Opportunities to improve civic literacy can occur at every stage of the dialogue. This can include highlighting the next steps involved in handling citizen’s requests, providing contextual information, and directing them to other conversations on their issue. 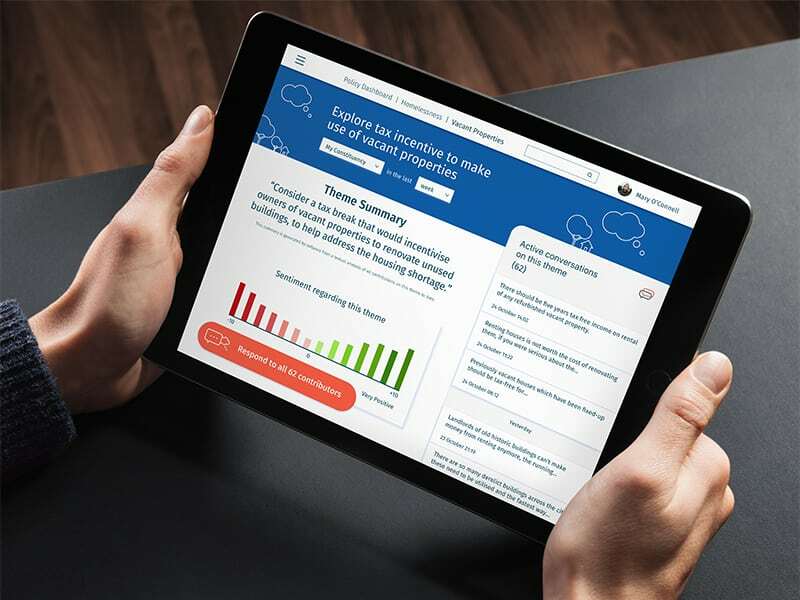 Keeping citizens updated on their issue can provide a glimpse into the work of government usually reserved for lobbyists, journalists, and those close to the legislative journey. Misinformation and negative narratives play a large part in citizen’s disillusionment with government. The dominance of social networks as the means of accessing news has made citizens more vulnerable to distorted representations of facts. Direct dialogue channels provide opportunities to inject non-partisan context into civic conversations by providing system-driven contextual information such as expert reports, international comparisons, or by asking questions and comparing answers against factual data. Reimagining civic participation so that the journey is clear, means working with communities to understand their needs and designing government services that meet them on their own terms. The process of decision-making is complex. Capturing all of the inputs that can influence each decision-maker is an unfeasible task. Citizens representations to the legislative process through novel digital channels should be recorded and made available to all. Ideally, such information on citizens and their representations would be provided at a macro level, to protect their identity and not discourage them from sharing personal thoughts or experiences. Citizens engage with the expectations that their voices will be combined with others to help shape their public representatives’ positions. Sometimes this means that final legislation will include parts of their recommendations, other times it will not. Today, it is nearly impossible for citizens to know if their input was considered, to what degree it was considered, what effect it has had on legislation, or why it was excluded. A system tracking messages sent to representatives can shed light on this process. For example, if a committee hearing leads to a position paper that includes suggestions raised by citizens, the system could automatically trigger a notification to those citizens about the development. These evidence trails do not need to be solely viewable by those who have engaged with each issue. By opening up the review process, society at large can gain insights into inputs and decisions along the legislative journey. Transparency can be more than just instilling trust, it can be utilised as a means of educating people, highlighting what policymakers are hearing beyond public opinion and media reporting. In conversation with the Moot Chatbot about government initiatives. Building on this research we developed ‘Moot – Redefining Democracy’ a conceptual vision of how technology could be used to create more effective communication between citizens and elected representatives. 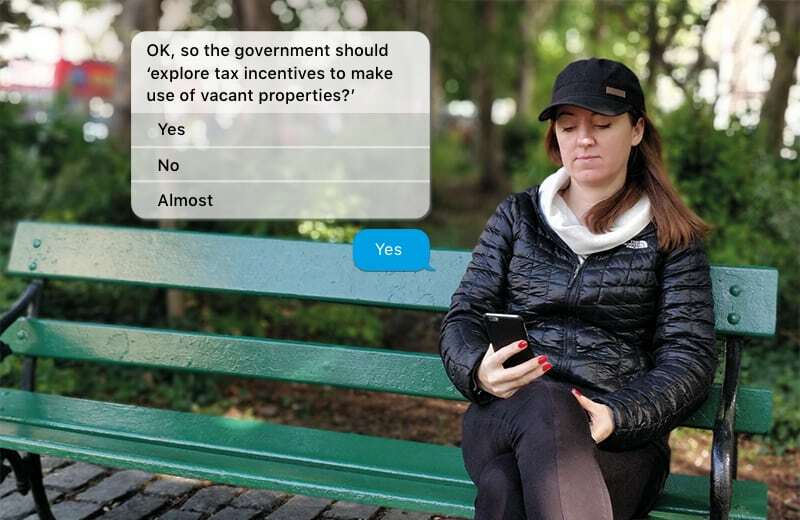 Our solution explores multi-modal communication channels, combined with natural language processing and AI to interpret, refine, and manage millions of individual citizen-initiated queries – making it easier for government to respond, inform and react. The Moot policy dashboard viewed on an iPad. As the political and social environment has changed, democratic institutions must adapt, as they have in the past. Previous technological advances were minor changes to the established communication model. Each made it easier for government to communicate policies to society, while also improving public access to information. However, the challenges facing political discourse today are more complex. The fragmentation and polarisation of media sources have undermined the central political narrative, leading to information disarray and breakdowns in communication between citizens and government. To repair this dialogue we need more dynamic and direct connections between citizens and their public institutions. The future is disruptive. The new technologies available today create possibilities for democracy which were unimaginable until now. Citizens can question policy, construct collaborative solutions and engage, and be engaged, like never before. It is the responsibility of practitioners, policymakers and government to incorporate these new technologies, consider the merits of improving citizen-government communication, and use technology to combat anti-government populism. 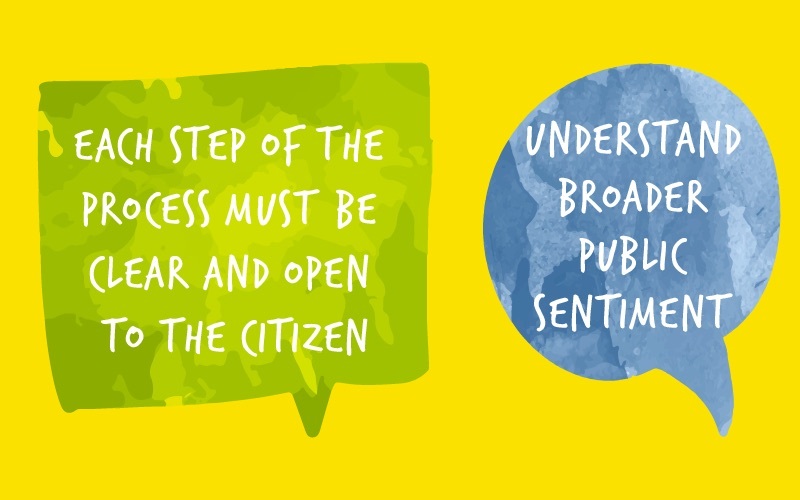 Governments need to champion clear communication channels so their citizens can better express their own concerns or ideas. Using the six design principles outlined in this paper they can ensure these systems are: immediate for citizens to access, inclusive, representative of all views, meaningful, promote greater understanding through information, and transparent. Such a transformation in citizen-government communication can realise this singular opportunity to truly open government. The complete white paper offers more detail on each of the design principles we have summarised here and features contributions from leading industry, policy, and advocacy thought leaders. These design principles are the result of a year-long global research and design initiative incorporating input from academia and industry. We began by identifying issues contributing to the breakdown of dialogue between citizens and government. We met with industry, political, and civic thought leaders around the world to gain insights and test ideas. Working with our academic partners we developed research projects for masters-level students. We hosted a design workshop that combined those students with domain experts. The workshop produced a range of conceptual solutions that formed the basis for further design exploration by the Frontend.com studio. 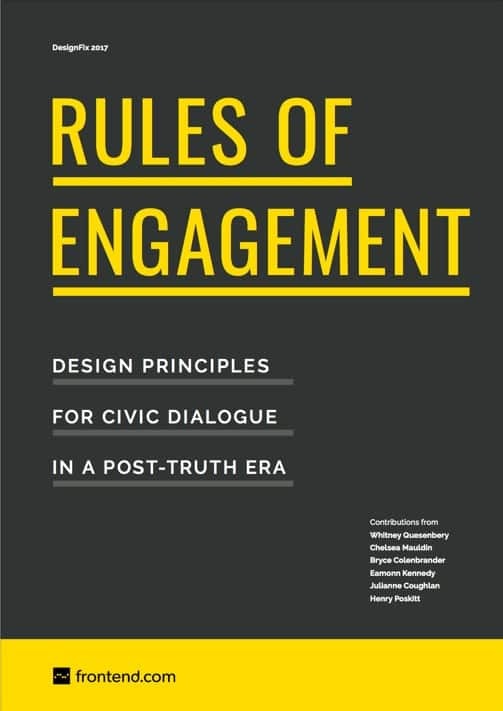 Based on our research, we created a set of design principles for citizen-initiated engagement. We developed the ‘Moot’ design concept to visualise and communicate these principles in a real-world context. We ran a pilot study to test the effects of our design principles on citizens and policymakers alike. The results of this pilot study supported the intent behind our design principles. Our collaborators on this Irish-led international design project were Atrovate, Publivate, Service Republic, Storyful, the National College of Art and Design, the Institute of Art, Design & Technology Dun Laoghaire, and the University of Limerick.